so i haven't posted anything on here in a while, mostly because i have been busy. but also because most of what i have been making is stuff to sell and posting that is a big no no. but here is something i made for my little boy for his first birthday. 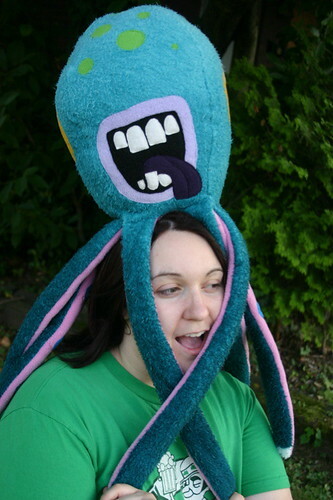 he is all fleece but the head and tentacles was a lunky lucky find of a furry fleece that had a big dark blue/green to lighter fade. it even had a white strip on the edge that made great white tentacle tips!! he is actually very simply constructed if you break him down into pieces. 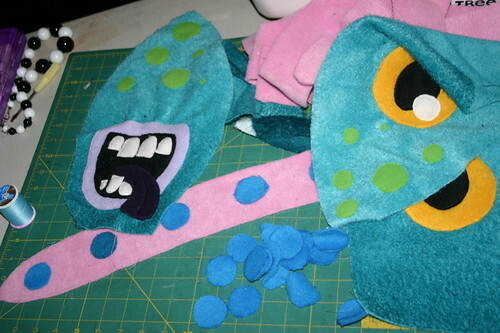 i just sewed the face parts , eyes, mouth, and spots on first. 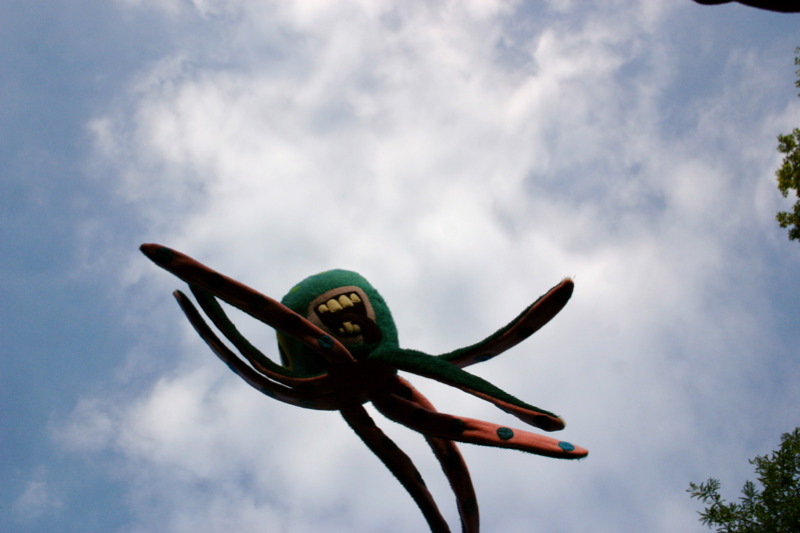 the tentacles are just long strips that come to a point. 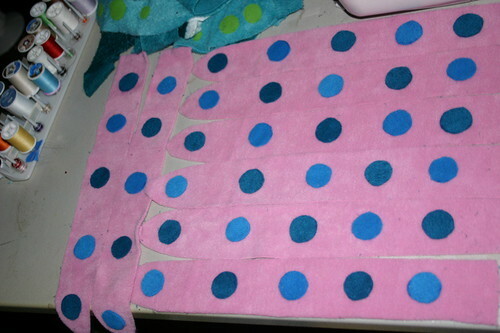 one green/blue one for the top and one pink one with circles sen on it. i alternated light and dark blue circles on the tentacles. then double stitched black X's in the middle of them. that's 5 suckers per tentacle for a total of 40 suckers. that was a whole lot of little circles to cut by hand! 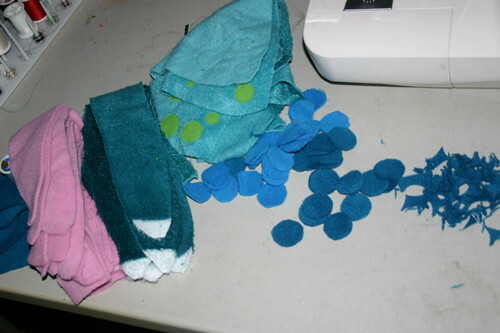 then i sewed each lemon wedge together with a square for the base with 2 tentacles sewn into the bottom seam of each piece. i know it would have helped explain better if i had gotten a picture of this step but hopefully you can figure out what i mean by looking at the finished octopus. but here he is! my little dude loves him and snuggles up to sleep with him at night. ps. I'm hitting this rocks (first time too). That is way too awesome! I wish I had a reason/person to make that for! Oh, that is so awesome! Love it! Adorable AND crazy---a classic combination. I LOVE his eyes. Is that Uncle Lumis`s Jumper I see on you? why yes it is! thank you for noticing! 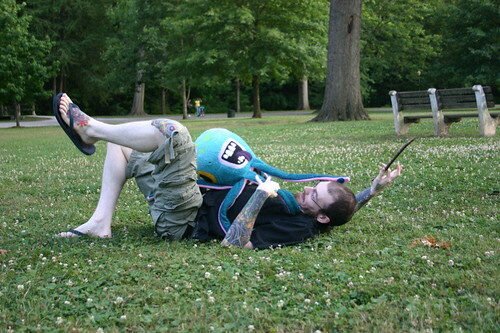 Hahahaha, I love that first action shot! I LOVE HIM! He's awesome. I'm glad you made him big. Could you possibly post a tut? Thanks! my boys will LOVE this! they seem to like anything moster-ish and colorful. this is perfect! thank you! what i posted is about as close to a tutorial as i can come up with as i didn't take pictures of every step along the way. and it's a little harder to explain anything without better pictures. but if you have any questions feel free to ask! :o that's cute but really friggin scary too. That's awesome. Thanks for the tutorial! You are just the COOLEST freakin' dad ever. I love the colors you used--very aquatic. 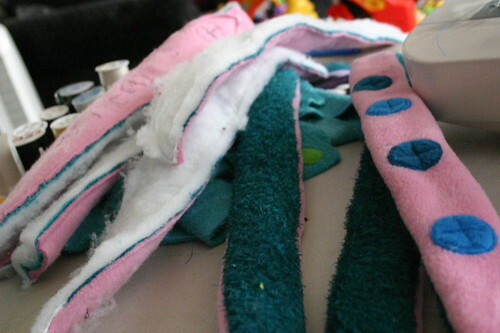 Your tentacles rule...I think cutting out all the suckers was worth it; they look great. I love the big yellow eyes, too. I really can't get over your super color choices! Also! 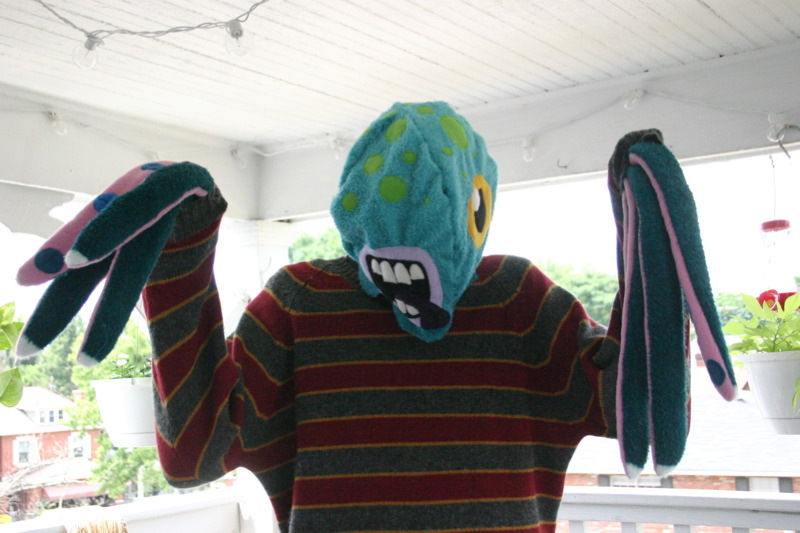 The picture of you in the stripey sweater with the octopus head and tentacles! Precious! I'd probably make mine without the teeth, but I nearly always leave the mouth off things. Not sure why. They're cute teeth, though. Oh my gosh. I think I'm in love. 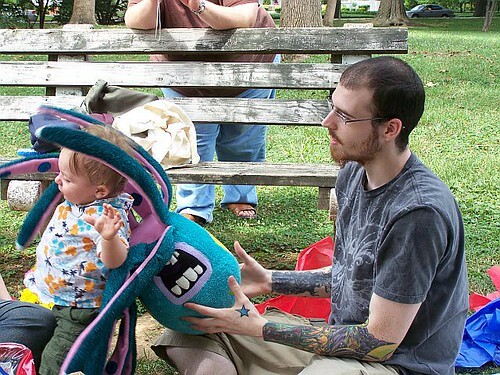 That's the most amazing toy octopus I've ever seen! sooo kyoot~ i'm adding this to my wists. hafta try this next time! Aww! 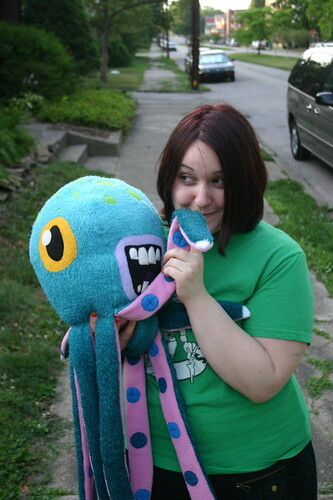 A kid that likes octopi? That's an amazing idea, the colors are awesome, too. Omg, I'm in love <33 So, so cute~! This is a sweet critter! I love the tattoo sleeve to! I love it! He looks so happy!